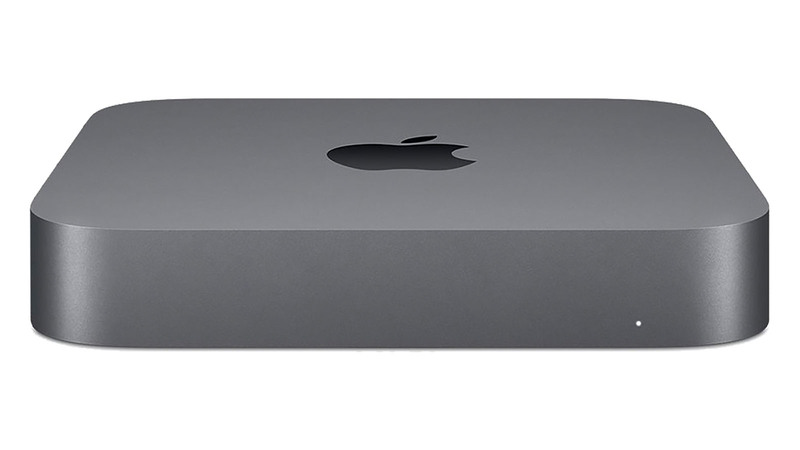 Following a longer-than-expected period between refreshes, the new Mac mini brings Apple's compact desktop Mac up to date. While staying a compact unit, measuring 7.7 inches square and just 1.4 inches thick, the specifications haven't been constrained, with Apple making considerable upgrades to the internals. Powering the new Mac mini is a choice of a quad-core Intel Core i3 clocked at 3.6 gigahertz at the base level and a six-core Core i5 clocked at 3.0GHz that can be boosted to 4.1GHz. At the top end is a six-core Intel Core i7 processor clocked at 3.2GHz with a 4.6GHz turbo boost. The available memory for the model starts with 8 gigabytes of DDR4, but it can be configured to use 16 gigabytes, 32 gigabytes, or even 64 gigabytes at maximum capacity. Storage for this model is solely PCIe-based SSDs, starting from 128 gigabytes with options for 256 gigabytes, 512 gigabytes, 1 terabyte, or two terabytes. To go with the upgraded internals, the externally visible parts have also been given a bit of a makeover, with the raw aluminum casing switched out for a Space Gray finish. The casing is also made of a new alloy that allows Apple to make it completely from recycled aluminum, making it probably one of the most environmentally friendly versions of the Mac mini to date. The back side includes quite a few new connections, with a pair of USB 3.0 ports accompanied by a HDMI 2.0 port, a headphone jack, power connection and button, an Ethernet port that can be upgraded to a 10-gigabit connection for an extra $100, and four Thunderbolt 3 ports. The use of HDMI 2.0 and Thunderbolt 3 enables it to be connected to two 4K displays at the same time, as well as being able to transfer data from external storage at high speeds, or even to connect an eGPU for more graphical power. It may have taken a long time to arrive, but the new Mac mini is still a mighty desktop computer that punches far higher than its small size suggests.